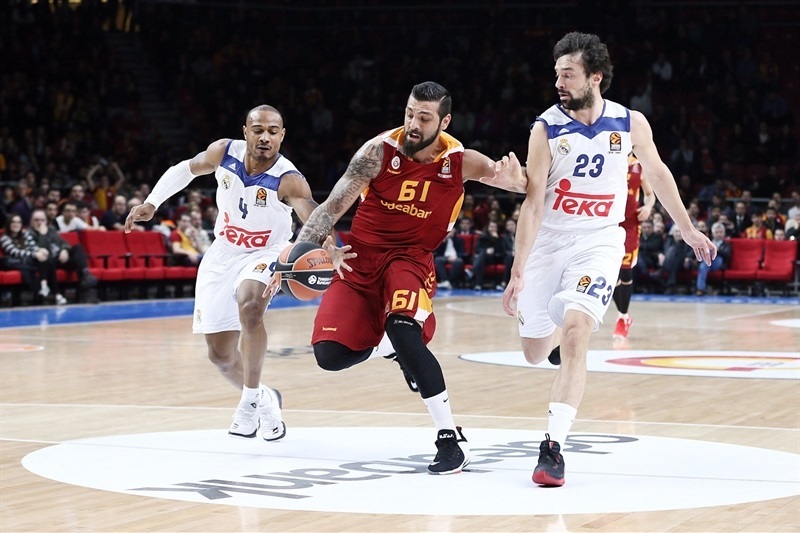 In a thriller that came down to the final seconds, Galatasaray Odeabank Istanbul held off a wild comeback to edge Real Madrid 87-84 at home on Friday. 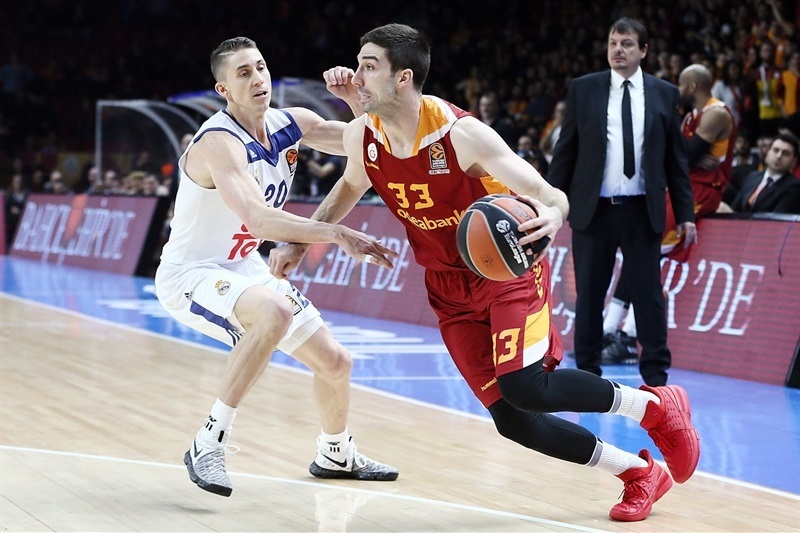 Galatasaray improved to 8-16, while Madrid dropped to 18-6 and missed its first chance to qualify for the playoffs. 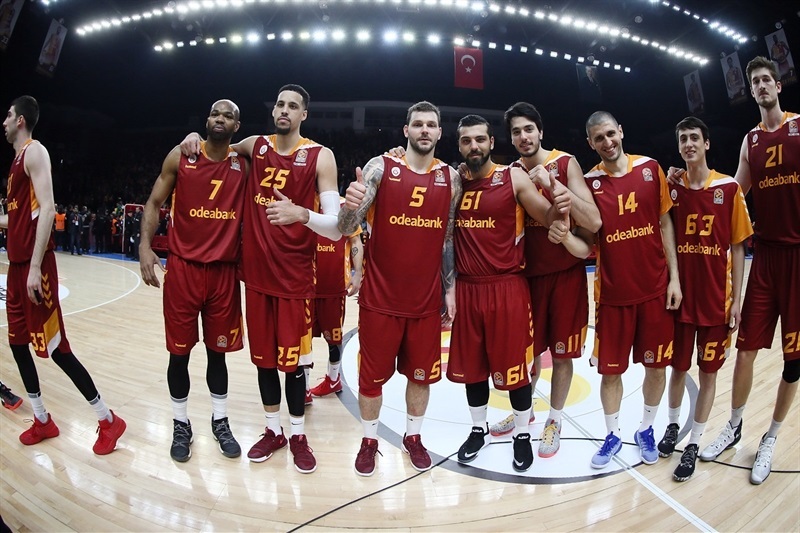 Austin Daye led the winners with 20 points, Jon Diebler added 17 on 5-of-5 three-point shooting, Vladimir Micov scored 12 and Goksenin Koksal and Alex Tyus netted 10 each for Galatasaray. 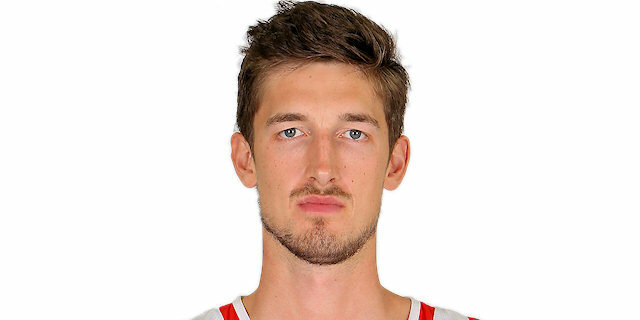 Anthony Randolph led Madrid with 16 points, Luka Doncic added 13 points, 8 rebounds and 8 assists, Jaycee Carroll scored 11 and Sergio Llull and Gustavo Ayon had 10 apiece in defeat. 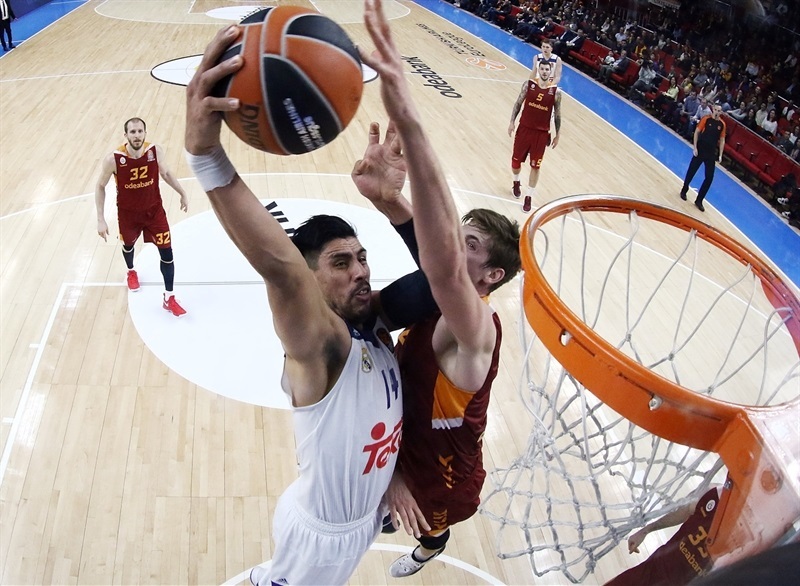 Galatasaray led 73-55 late in the third quarter, but a wild comeback gave Madrid an 80-84 edge. Madrid was held scoreless in the final two minutes and a final 7-0 run gave the hosts the win. 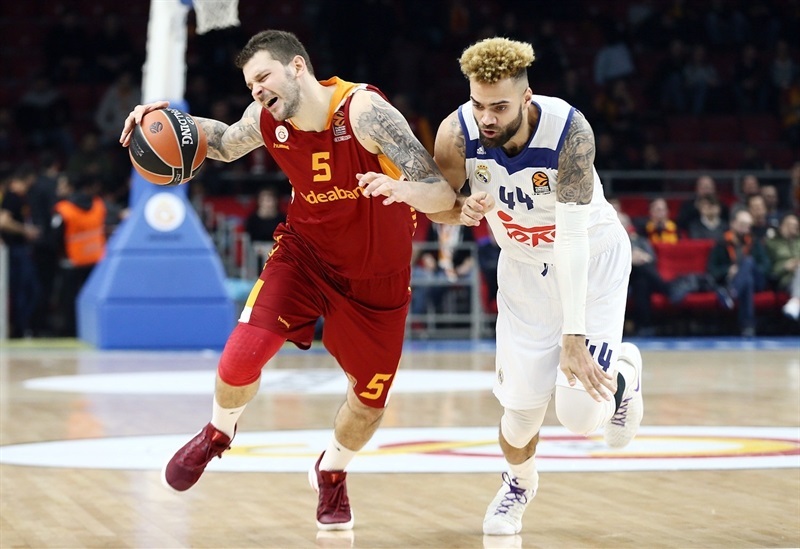 Galatasaray finished the game with 12 offensive rebounds, 25 assists and 14 three-point shots. 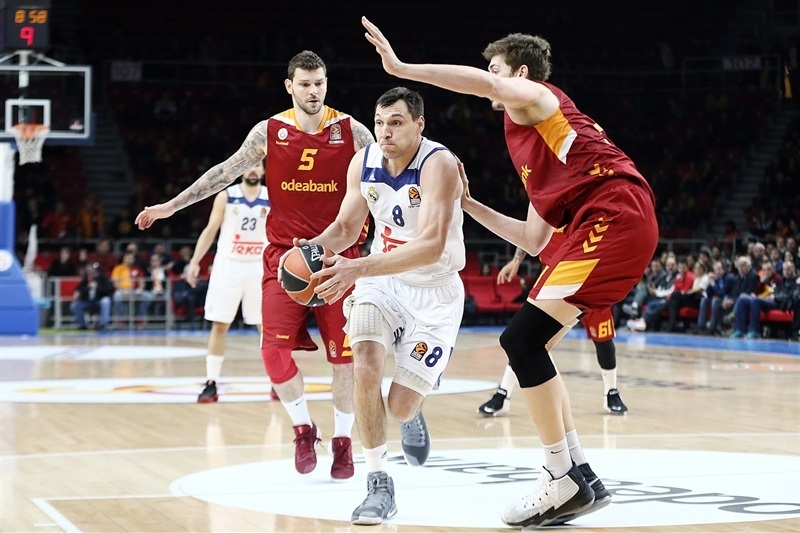 Jonas Maciulis got Madrid going with a close basket and Llull added a fast break layup, but back-to-back triples by Koksal gave Galatasaray a 6-4 lead. Dontaye Draper, Llull, Daye and Micov joined the three-point shootout, but a layup by Ayon helped Madrid tie the game at 12-12. Daye scored down low to ignite a 6-0 Galatasaray run and soon added a three-pointer for a 21-14 lead. Doncic and Randolph stepped up for Madrid, but a buzzer-beating layup by Micov gave the hosts a 25-20 lead after 10 minutes. 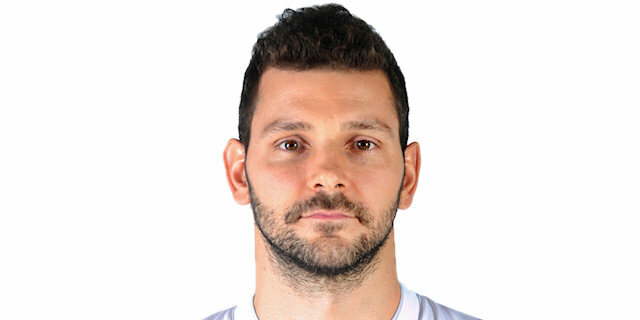 Ayon followed a huge dunk with a layup early in the second quarter, but Guler and Ege Arar helped Galatasaray to stay in charge, 32-26. It didn't last long, however, as Rudy Fernandez and Carroll each hit a triple in a 1-8 run that prompted the hosts to call timeout at 33-34. 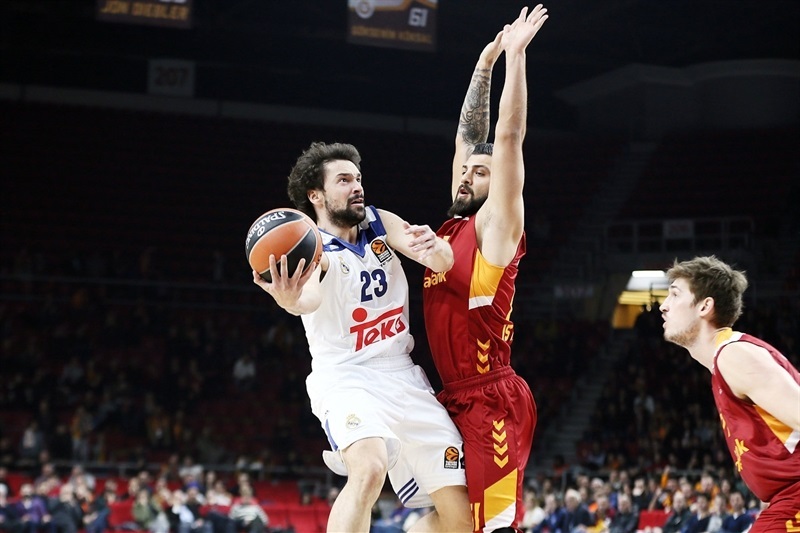 Diebler and Koksal rescued Galatasaray, but back-to-back dunks by Othello Hunter and another three-pointer by Carroll saw Madrid regain the lead, 40-41. 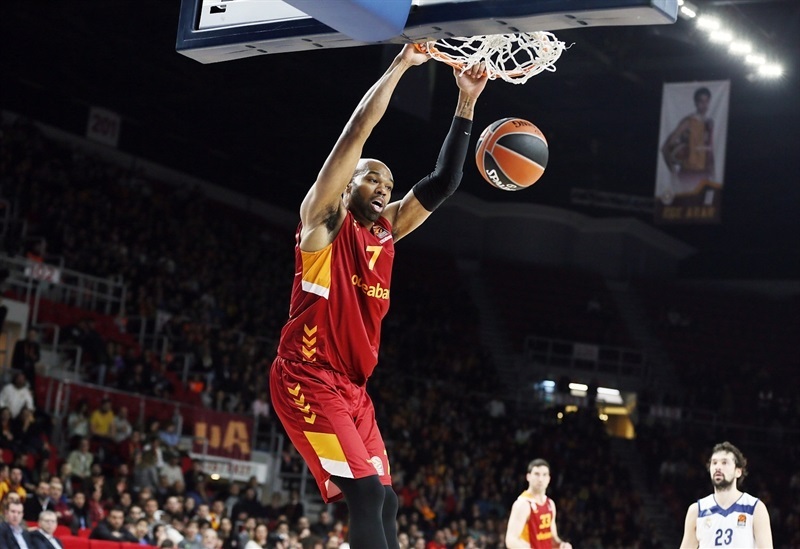 Tyus dunk twice and Diebler followed a fallaway jumper with a triple for a 49-46 Galatasaray edge at halftime. Micov and Daye each struck from downtown right after the break and Tibor Pleiss followed a layup with a three-point play to make it a double-digit game, 60-48. 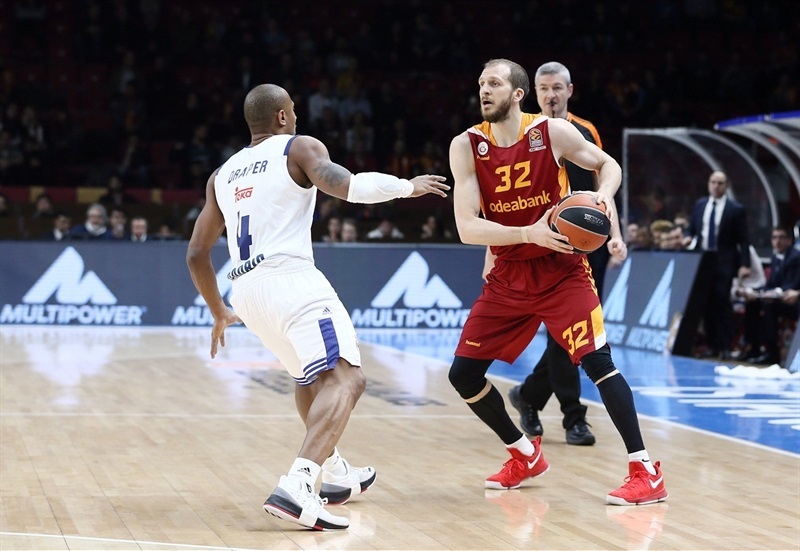 Daye kept pushing Galatasaray, Micov made free throws, Koksal scored down low and a three-pointer by Diebler broke the game open at 73-55. A jumper by Fernandez and a buzzer-beating triple by Doncic brought Madrid within 72-60 after 30 minutes. Doncic and Carroll hit consecutive floaters to ignite Madrid's comeback. 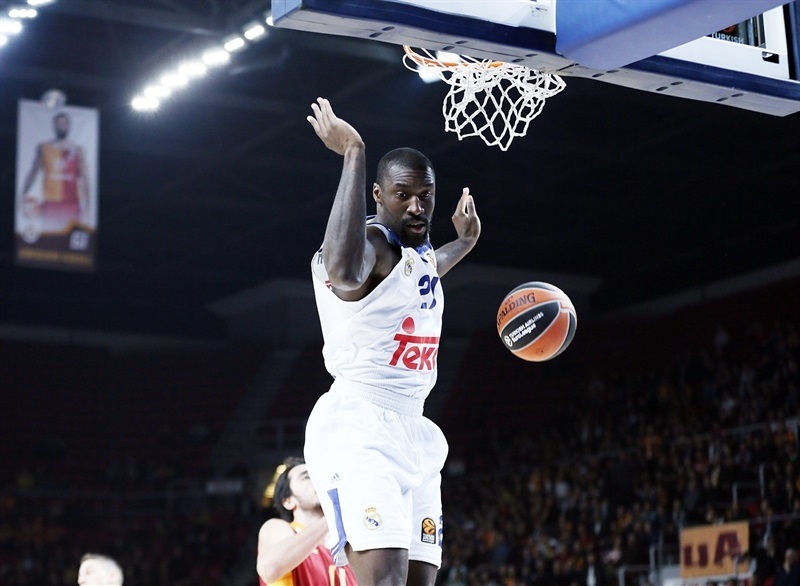 Randolph stepped up for the guests and a three-pointers by Doncic and Fernandez brought Madrid within 80-76. An alley-oop slam by Hunter and a triple by Randolph completed Madrid's wild comeback, 80-81. Carroll and Diebler each struck from downtown and an alley-oop dunk by Tyus gave Galatasaray an 85-84 edge with 48.1 seconds left. 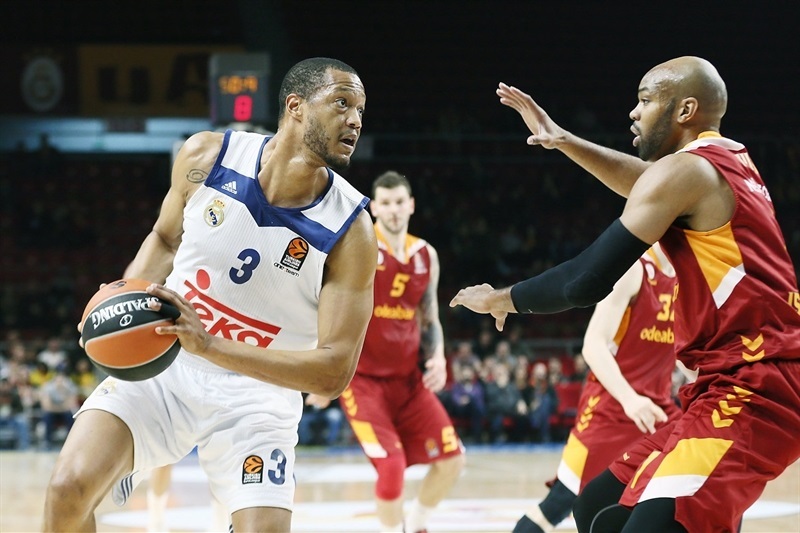 Madrid fouled on Daye with 11.7 seconds to go and he hit both attempts for an 87-84 score. However Madrid could not score down the stretch and Galatasaray celebrated a big win! "Our players showed amazing character tonight. It's not easy to play these kinds of games when you don't have goals mentally. You play against the league leader. We played smart basketball from the beginning of the game. We put serious pressure on Real Madrid's guards. We defended well under the basket with Pleiss and Daye. We took the lead by 17 points with Sinan's penetrations and the outside shots of Micov and Diebler. Then we showed signs of fatigue. We won by evaluating the strategy of the game well in the last minute." 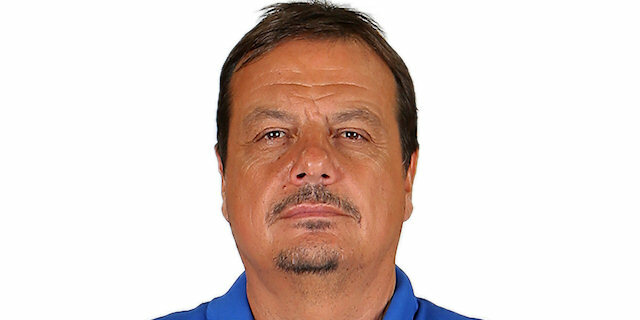 "First, congratulations to Galatasaray for the victory. They played a very good, solid game during 40 minutes. I think our first half was not very good defensively. They were moving the ball easily, scoring easy baskets, and we were always behind them. The only good thing about the first half was that we were only losing by three points. Our second half was much better but that came with Galatasaray's best minutes in the third quarter. They got a big advantage, but I think we made a big effort to come back to the game. In the decisive minutes in the end, there were two or three key plays where they were more fortunate, let's say. Congratulations to Galatasaray, I think they played solid, a good game, and they deserved to win." "It was a very important win for us against one of the best teams in Europe. We found the strength to win because we were missing too many players. We had some problems the last weeks but reacted and won the game. It is very important because we have a very tough schedule in the next two, three weeks and with a short rotation, it is going to be very hard." "It was not an easy win because Real Madrid is right now the best team in the EuroLeague and it was tough to beat them. We had this crowd behind us that helped us a lot. We played together as a team, played really hard defense and in the end we won, and I think we deserved it. Our aggressiveness on the boards was really important for us. We won as a team and have to continue like this. We beat Real Madrid! It is not easy, it is one of the best teams, we have to continue like that."